Lewis Hamilton's first week at the wheel of the car that carries his hopes this year ended a lot better than it started. 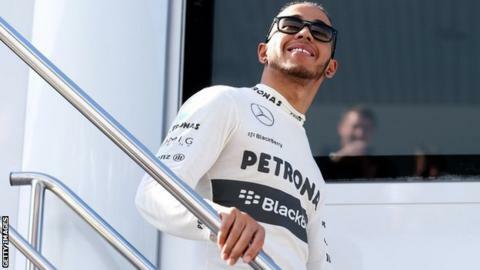 After a brake failure caused a crash on his first day's running for Mercedes at the first pre-season test, Hamilton managed a full day on Friday and was finally able to get down to meaningful work. The reliability was exactly what Mercedes needed after Hamilton and team-mate Nico Rosberg managed less than 30 laps between them on the first two days of the four-day test at Spain's Jerez circuit. As for the car's performance, well, after his curtailed run on Wednesday, Hamilton made it clear the Mercedes lacked aerodynamic downforce - the key performance definer in F1. "I'm pushing the aero guys as hard as I can because we need more aero, definitely," he said. "Coming from a McLaren that was so competitive at the end of last year and had incredible downforce, I definitely notice the difference, but it is nowhere near as bad as it could be." On Friday, he made the point again, adding: "We have some work to do but it doesn't feel like it's a disaster." Credit to Hamilton for his openness among the vague references to "a positive start" from virtually everyone else. Hamilton's fastest time on Friday was good enough for sixth place on the day. His lap of one minute 18.905 seconds compares with the overall best time of the week, set by Ferrari's Felipe Massa on the third day, of 1:17.879. But trying to read anything into the lap times at Jerez was even harder than it normally is at a pre-season test. Which means very hard indeed. Fuel loads make a huge difference to lap times, and Jerez's highly abrasive surface could hardly have been less suited to the new tyres F1 supplier Pirelli has designed for 2013, which deteriorated much quicker than normal. That meant that looking at average lap times and longer runs was less informative than usual. Nevertheless, certain things did stand out. On the first day, Massa described Jenson Button's pace-setting time of 1:18.861 as "incredible", considering it was on a dirty track on the hardest of the available tyre compounds and on the McLaren's first day of running. In Jerez even some of the teams seemed to be in the dark. Hamilton said he had 'asked the guys to try and predict (where we are) but they don't know. It would just be a guess'. The Brazilian was still sticking with that assessment two days later, while admitting that some people may well feel the same way about his own fastest lap. It is traditional during pre-season testing for the drivers and teams to emphasise that they can't make any judgements about relative competitiveness. Yet it is equally normal to speak to them after qualifying at the first race of the season and have them say they're not surprised by their grid position because they basically knew where they were from the testing times. The teams, after all, are able to work out much more effectively than the media who is doing what with fuel loads, and what the lap times mean. But in Jerez even some of the teams seemed to be in the dark. Hamilton said he had "asked the guys to try and predict [where we are] but they don't know. It would just be a guess." At Ferrari, a senior engineer said they did not really understand where Massa's fastest time came from. They were 1.5 seconds off the pace, he said, and then suddenly they were 1.5 seconds quicker than they should have been. Meanwhile, a 1:18.565 done by Red Bull's Sebastian Vettel on his first lap on hard tyres on the final day looked impressive, especially as Kimi Raikkonen did a 1:18.915 in the Lotus right afterwards on mediums. The picture is complicated further by the fact that the lap-time difference between the different tyres varies from team to team. First, take into account the substantial performance differences between the three types of tyre in Jerez (more than half a second between the soft and the medium, and the hard counter-intuitively 0.4secs quicker than the medium). Then bear in mind that the top teams rarely run their cars really low on fuel in testing - and presumably Force India, Sauber and Toro Rosso did to do those times. You're left with a familiar-looking picture. It would mean the top four teams were all closely matched, and hard to separate, but possibly with McLaren slightly ahead (based on Button's first-day time on the dirty track), closely followed by the Ferrari, which is clearly much tidier aerodynamically than last year, then the Red Bull and Lotus. The Mercedes would be a little further back, with Hamilton and Rosberg at a similar pace in the 2008 world champion's first test with an unfamiliar car and team. Of course, that's just an informed theory and without the fuel-load data it's impossible to be sure. But it's backed up by engineers who said Vettel's 1:18.5 was not as forbidding as it looked, and that on longer runs the McLaren looked especially strong in terms of managing its tyre degradation, with the Ferrari pretty close behind. Meanwhile, BBC F1 technical analyst Gary Anderson spent considerable time watching out on the track and felt the Red Bull and Lotus looked especially impressive. The Ferrari was fast, but the rear was tending to give up at the exit of corners; the McLaren also quick, but it was having the opposite problem - understeer. The Mercedes had understeer on entry and a snappy rear on exit - the signs of a car with a lack of grip. Which tallies with what Hamilton said. Far away from all this, meanwhile, was a certain Fernando Alonso, who chose to skip Jerez and go away somewhere warm and sunny to work on his fitness. He was keeping in touch with Ferrari via email. Officially, Alonso said he needed the extra time to ensure he was fully mentally prepared for the rigours of what will be a long, hard season. Unofficially, it is thought Alonso felt the test would be meaningless in terms of analysing performance - and if it was only going to be reliability runs and aerodynamic data-gathering, the better to skip it and stay fresh. The more you watched drivers sit in the pits for hours on end while their cars were fixed, and the more you heard teams and drivers saying the problems with tyres meant this test was more about ticking boxes than performance, the more it seemed like Alonso might have been on to something. The Spaniard will take a full part in the second test from 18-22 February at Barcelona's Circuit de Catalunya, a circuit that examines the all-round abilities of an F1 car better than almost any other, and where tyre performance is much more representative. For Alonso, and for everyone else, that is where it starts to get serious.